Name a shooter that hasn't tried to copy the gameplay style of popular FPS games such as Halo or Call of Duty? You're probably having a difficult time even thinking of one. 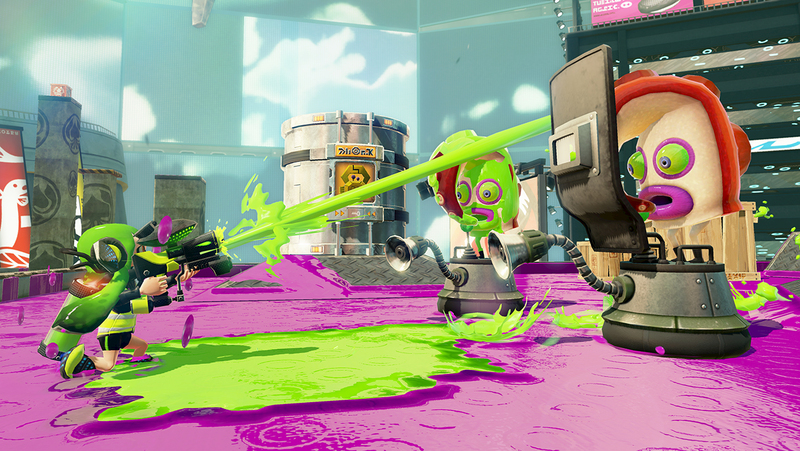 This is where Splatoon is a complete breath of fresh air. Forgive this review for its lateness, I've got 3 very good excuses, firstly, the copy that I preordered turned up a week late. Secondly, Nintendo keep adding free content to it, and thirdly, because I can't put the game down long enough to sit down and write about it. Splatoon is a weird shooter, unlike every other shooter where it's all about head shots and kill streaks, Splatoon has you shooting at the floor. The basic point of the game is to cover the ground with as much ink as you can in 3 minutes. You run about firing your paint gun, but once you run out of ink, you have to transform into a Squid, then swim around in your own ink to refill your reserve tank. It's an interesting mechanic to say the least. While you don't have to kill other players, it certainly helps as it gives you a bit of breathing room to cover more ground. this has you in a more combat heavy situations. Currently it's only game type is called Splat Zone and has you capturing certain sections of the map, by spraying enough ink to control that zone. Another gametype coming soon is a sort of tower defence game. You battle it out to have one of your team mates stand on a central platform, while they hold it the platform moves around the map. It makes them a huge target as everyone tries to knock them off and grab the tower for themselves. There's not a whole lot of maps to play on, and even weirder, you can only play from 2 at a time. Every 4 hours the map selection rotates and you're given 2 different maps to play on, it's a strange way to play and what makes it worse is an unskippable cutscenes of two Squid girls telling you what the current rotation is, plays every time you start the game and whenever the maps change. Luckily you can scroll through it pretty quickly if you just hammer the A button. Curse you and your paint shield! 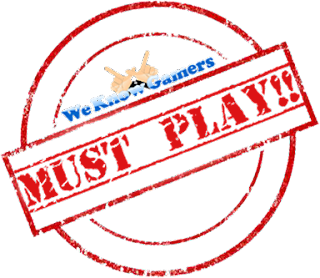 As for single player, there's a full campaign with 30 missions for you to learn the basics if you don't want to throw yourself into the multiplayer deep end. 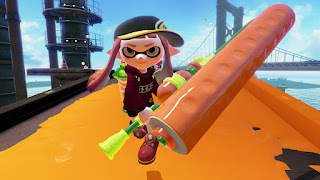 You play as Agent 3, battling against the Octoling army trying to rescue the kidnapped Zapfish. After beating a few missions in each zone you'll have a showdown with some large bosses that could have been ripped straight out of Mario Sunshine.You only get to use the splat gun, a machine gun type weapon for rapid ink spraying. If you have any of the Splatoon Amiibo, you can play 15 select stages as well as all 6 bosses using different weapons. The girl Amiibo has sniper rifle scenarios and the boy has the paint roller. The Squid that only comes with the special edition of the game (or from scalpers on eBay) has a mixture of weapon challenges. Completing all the Amiibo missions will unlock some exclusive outfits, this is the first time that content has been actively gated off with Amiibos which is kind of annoying, mainly because it's an extra thing you have to buy, and that's if you can even track them down in the first place! Everything is connected via a hub world called Inkopolis, here there's a variety of clothes stores. Hats, shirts and shoes all have abilities tied to them to give you slight stat boosts for the real part of the game. Also in Inkopolis, you'll see a whole bunch of other players standing around, not in real time mind you, just an avatar of their Inkling. They'll be wearing the outfit they currently have equipped, which if you go and talk to them, you can order the same gear as what they're wearing. As well as this, if that player has posted on the Splatoon Miiverse, you'll see their latest post floating about their head. This Miiverse integration is a touch of pure genius because as well as over a players head, the Miiverse posts cover the walls of Inkopolis like graffitti! The whole thing inspired me to doodle Beat from Jet Set Radio (see below) with a little Squid twist. The puns and memes are currently filling the game, but it shows how creative the community can be when it's implemented properly. Inkopolis really gives the game a bit more character, and is way more interesting than just browsing through menu screens. I love the Miiverse on this game. I've got to be honest, my Wii U has not seen a whole lot of use for a while, but Splatoon has completely changed that. Bringing a completely new feel to the shooter game, and with it's quick paced action and addictive gameplay, this is pretty much essential for anyone who has a Wii U and likes bright colours.